Photo courtesy of PJG, thanks! With this bread, I completed the BBA CHALLENGE! This last bread took 3 days to prepare. 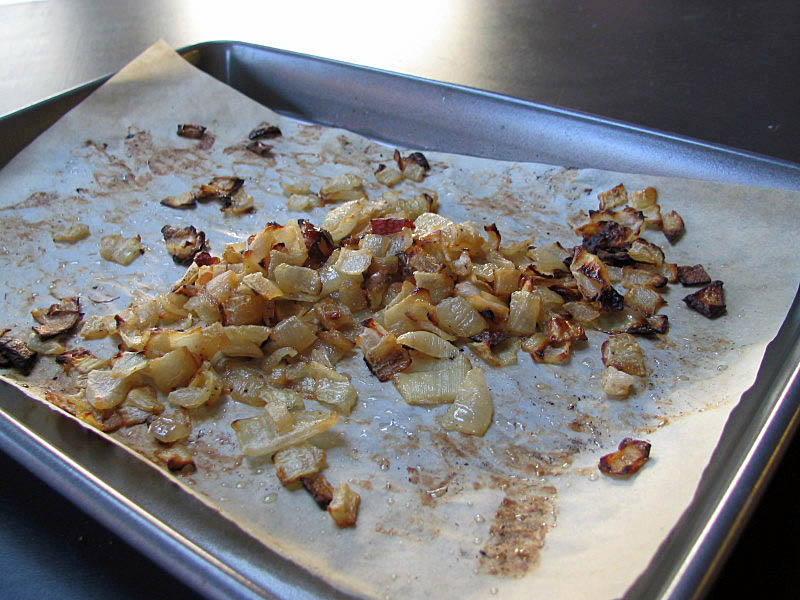 The sourdough sponge, made on the first day, was mixed and shaped on the second day, and after a night in the fridge it was topped with roasted onions and grated asiago cheese, then finally baked. I made a half recipe, which was still enough for one big round loaf. and added to the bread 30 minutes before baking …. 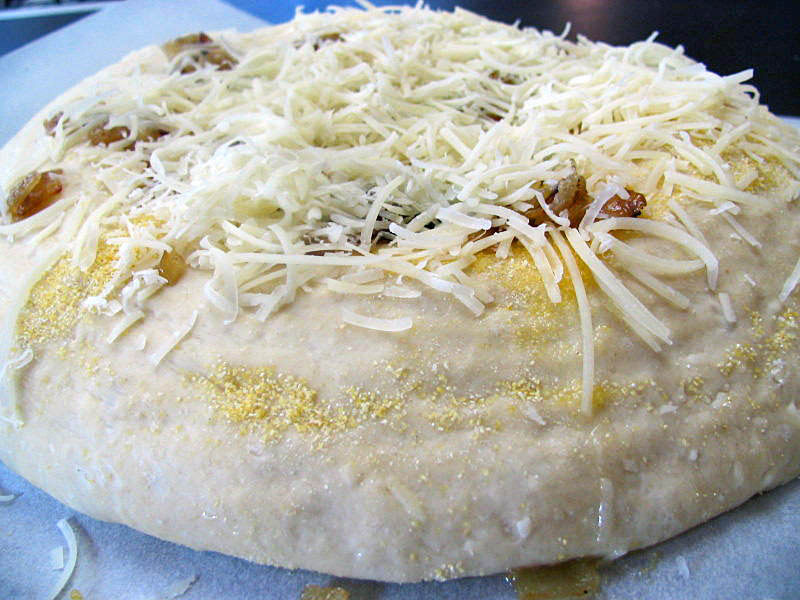 The dough contains a lot of grated asiago cheese, so each bite acquires its sharp flavor, mellowed by the sweet roasted onions. What a beautiful combination! 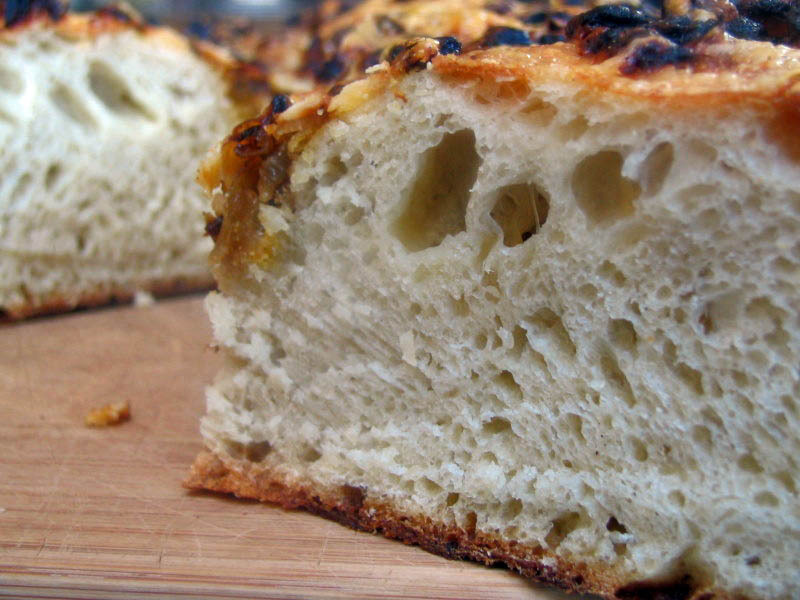 You can check the Roasted Onion Asiago bread made by Oggi (the first baker to complete BBA Challenge) by clicking here…. Awesome!! Congratulations! Your miche looks exactly like the one in the book. I think I’m going to cut the recipe in half, too. I just made the potato, cheddar & chive torpedoes, so I’m ready for this bread next. A big congratulations to you for completing the challenge. I’m so proud of you! Oh…. and the bread looks absolutely fabulous! Wooo HOOO!! I hope to get there some day soon! Being on tour makes it difficult but I will finish!!! They all look amazing! Congratulations! Happy Baking…whats next? That looks ridiculous! I cannot wait to make it! You are sooo my hero! 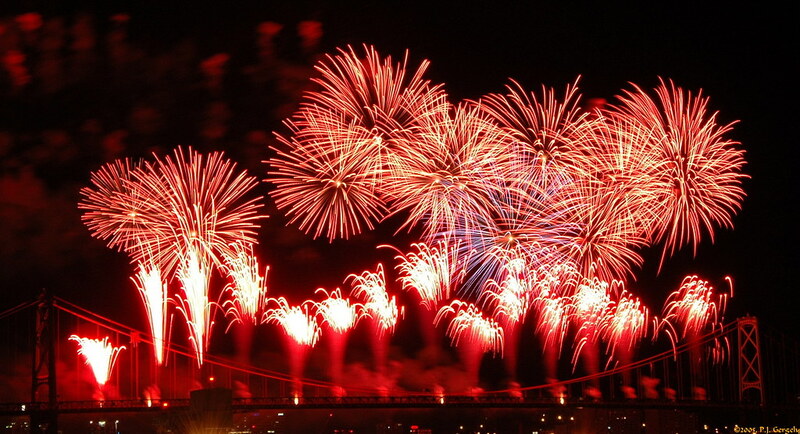 Love the fireworks and the ratings. Way to go, very impressive work. Well you went out with a bang! Congratulations on finishing. I love the slideshow of all your breads and the rating system. The Asiago Miche looks amazing. I’ll be waiting and watching to see what you’ll be up to next! Marie Louise, so nice to see you here! If you are interested in quick breads, cakes, tortes, pies, etc., and are crazy enough to try another “Challenge”, I am going to start baking my way through “The Modern Baker” by Nick Malgieri after I finish with BBA. Drop me a line, and I’ll add you to the list (even if it’s just as a maybe). Congratulations! Looks like a delicious loaf to end the challenge. I hope to bake my way through that book some day. Sally, your blog is gorgeous, just like you! Thanks so much for your visit to my blog. (I found where you reside in Oklahoma. Our oldest daughter graduated from OSU. Years ago we lived in the Tulsa area. I LOVE Oklahoma!). Why oh why don’t I live closer??? Congrats. You are amazing in so many ways! @coffegrounded: you are too nice! Glad you are enjoying the challenge, it does have ups and downs…. Hey, Jen! I showed your blog to one of our students, you and her have a lot in common, it’s too bad you live far away, but at least we had a few years of fun and science, science and fun together…. Congratulations, you did it in style! Very cool. I’ve enjoyed reading about your bread baking adventures. Big congratulations on completing your book project and making your blog so lovely! Congratulations! 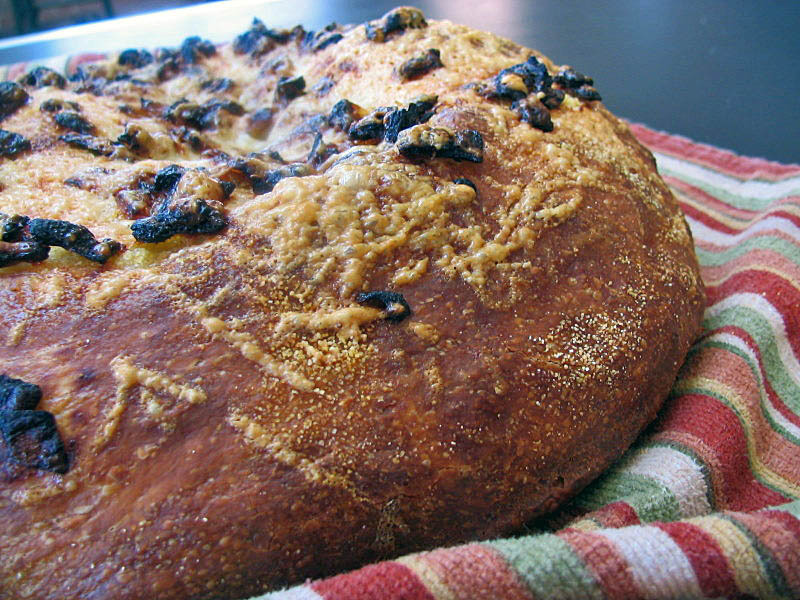 It has been a joy baking with you and reading about your experiences with the breads. 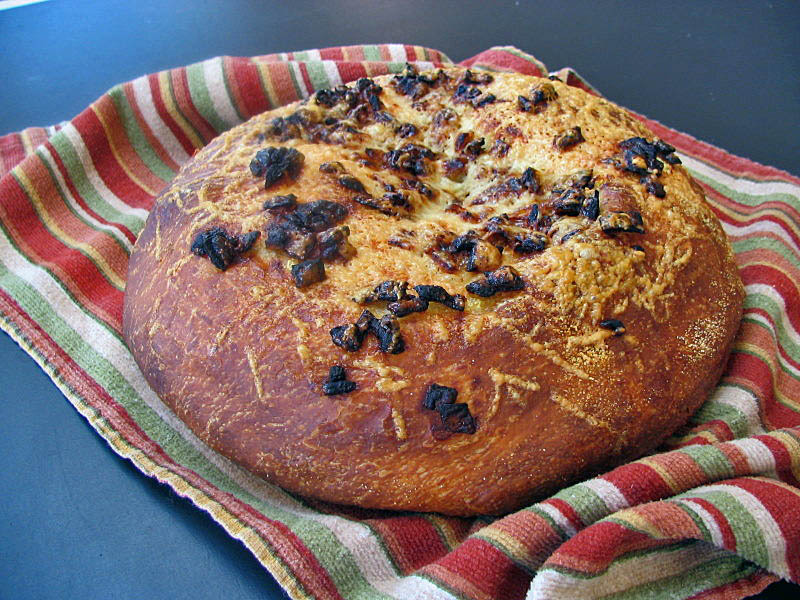 You have been one of my bread inspirations with your great photos and amazing breads. As to what’s next? I’ll just keep reading! I can’t believe I missed this post. Even though I’m pretty sure I’ve read it some time ago and just forgot to comment. Anyway, congratulations on finishing the challenge! Will you join us with the Mellow Baker or the Modern Baker Challenge? Would enjoy to continue baking with you. I also just finished the BBA challenge – YAY!